If there is one thing I always neglect when it comes to my beauty regime, it has got to be my feet. Aside from the (very) occasional haphazard application of polish to my toes, I literally do nothing else to look after them. And, considering how much feet go through (you know, what with being walked on all day and all) I thought it was about time this changed. I will admit, the beautiful summer weather has definitely spurred on my mission to get my tootsies looking their best - slipping on your sandals when you have chipped toe polish and a whole lot of rough skin going on isn't the nicest. Add to that the fact I'm going on holiday soon and will be donning flipflops 90% of the time, I thought it was probably best to start incorporating a bit of foot care (how glamorous?) into my beauty regime. When it comes to making your feet look their most fabulous, there are three key products you want to invest in: a foot scrub, a foot cream, and some kind of foot-scrubbing gadget. Now, I'll admit that as I haven't really been one to beautify my feet much up until now, I haven't tried that many foot products. However, I know a good product when I see one and so I thought I'd run through the foot care favourites I've been loving recently. 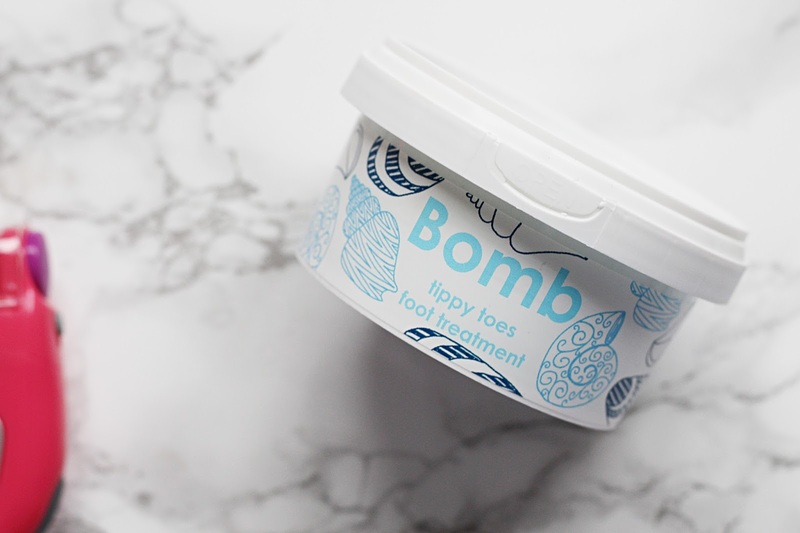 First up, I just have to confess my love for Bomb Cosmetics' incredible foot care duo. If creating amazing candles wasn't enough, Bomb Cosmetics also do some pretty awesome beauty bits, and since receiving these I haven't been able to stop using them. The Dr Foot Refreshing Foot Scrub* is fantastic - in an absolutely gorgeous citrus scent, it contains shea butter and sunflower oil to moisturise and hydrate feet, along with black pepper and lemongrass essential oils to help perk up tired feet. It definitely feels super refreshing and isn't too harsh on the feet either. Also from Bomb Cosmetics, the Tippy Toe Revitalising Foot Lotion* is possibly my favourite of all the foot products featured in this post - this is just the most indulgent and luxurious treat for your feet ever, with 30% pure shea butter, peppermint and rosemary essential oils and sunflower oil, it is super rich and melts from a lotion into more of an oil once rubbed in. It leaves my feet feeling incredible and so every chance I've had I've been slathering them in this! 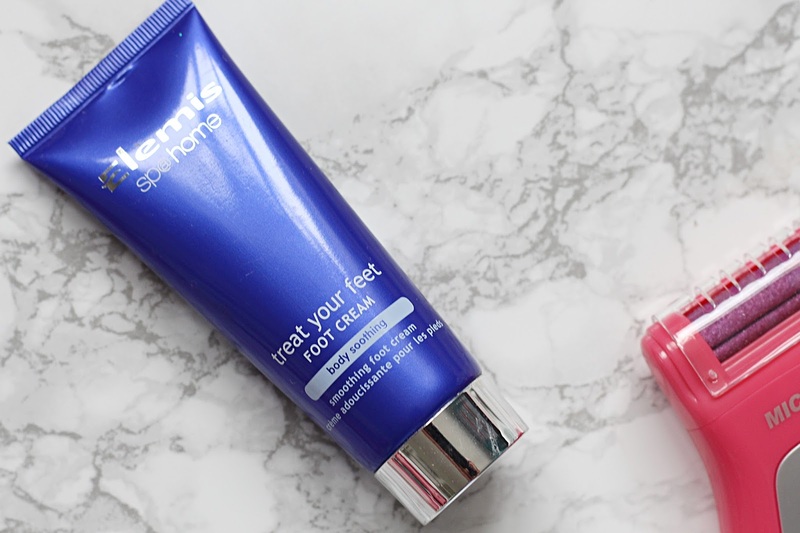 If you're looking for a bit more of a travel-friendly foot cream, or perhaps have a few more pennies to spend, however, I'm also a big fan of Elemis' Treat Your Feet Foot Cream. A little of this goes a long way and as it's infused with patchouli, eucalyptus and lemon oils, it smells amazing. 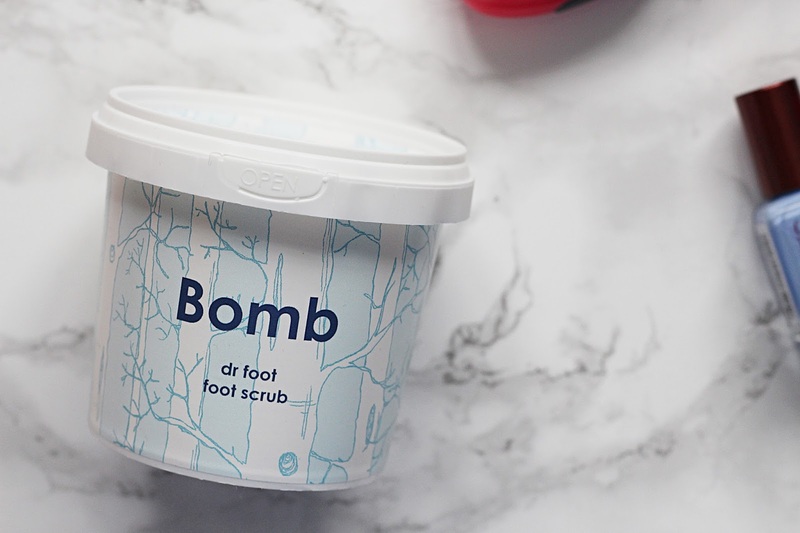 It contains shea butter and jojoba oil to intensely moisturise and soften feet, and definitely feels somewhat thicker than the Bomb Cosmetics lotion, so is perhaps better for those suffering with really dry feet. Finally, the most exciting thing about pampering your feet has got to be when it's time to get the gadgets out. 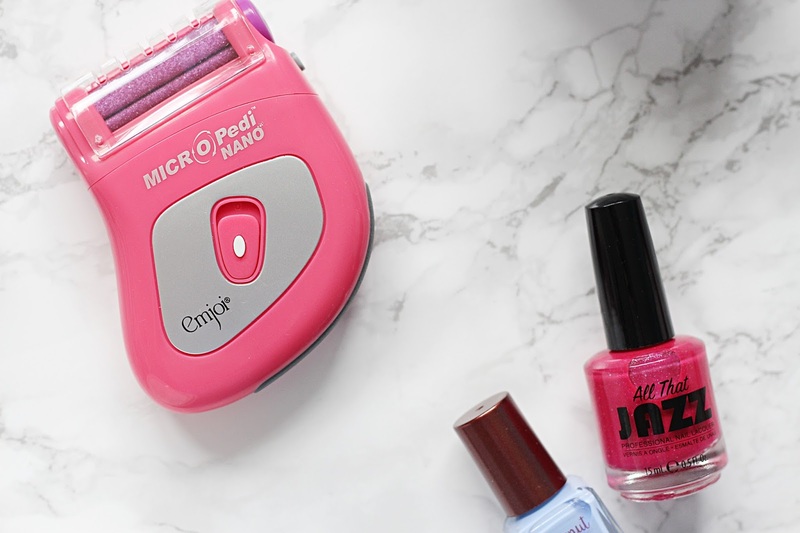 Now, I've always admired these hard skin removing products from afar, never feeling the need to really invest in one, but after trying the MicroPedi Nano* I feel like this might have to change. It works to exfoliate and get rid of any dry, hard skin, leaving your feet feeling super soft and smooth. I was a bit apprehensive about using it at first, but once you get into it it's actually really satisfying almost sanding away at the hard bits on your feet! In a matter of minutes my feet were feeling SO much softer and smoother, all thanks to that nifty little gadget. Of course, it wouldn't be a proper treat for your feet without painting those toes, and at the moment my go-to polishes have got to be All That Jazz polish in this gorgeous sparkly pink colour, or, if I want to go a bit more pastel and pretty, I'll opt for Barry M's Coconut Infusion lacquer in Laguna. Both apply beautifully and look fab on the toes! 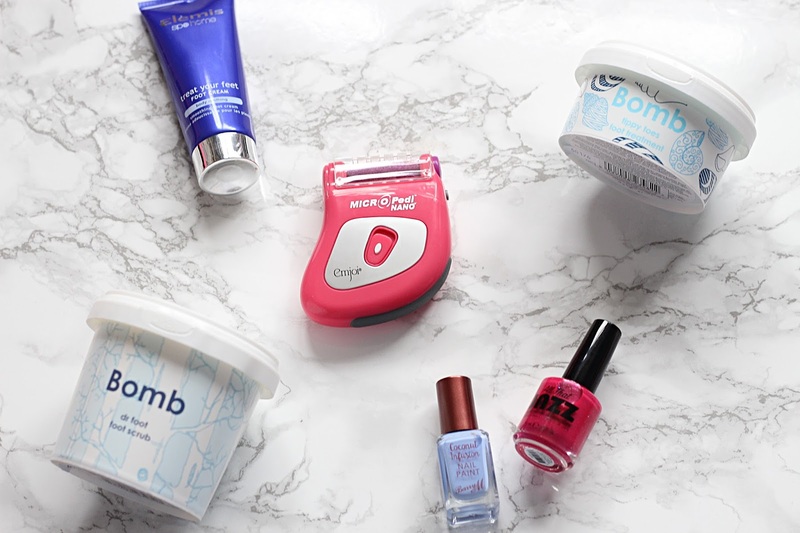 What are your foot-pampering must-haves? Do you neglect your feet when it comes to your beauty regime too? Let me know!